A scenario may arise where you have a Word document that you want to populate by utilizing Linx. A Word document must exist (To get around having to setup a document each time, simply create a “template” and then use Linx to copy this template to the target location). Zip the Word Document Files creating a new Word Document. Create a CustomType called ‘PlaceholderAndValue ‘ which will hold a Placeholder and Value, this will be used as a “dictionary”. The custom type will be looped through and depending on the CustomType.Placeholder string, if found in the doc, they will be replaced by the CustomType .Value. Using the GenerateRandom function: Generate a “random” number which will then be converted into a string which will be used as the temporary file location for the Unzipped word document file to be generated to (see below). 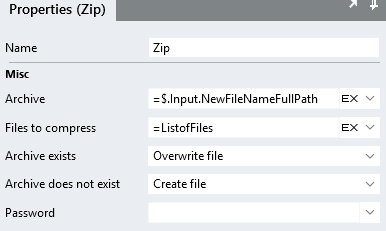 Using the Unzip function: Unzip the “template” location and extract the files to the WordDocTemplateFullPath+RandomNumberGeneratedAbove.Base64String. This will create a number of new files in the target location, one of them being the xml content of the wod document. Using a TextFileRead function: Read the file located at WordDocTemplateFullPath+RandomNumberGeneratedAbove.Base64String + "\word\document.xml". For the ‘Read Type’, use ‘Complete’. Assign the output of the TextFileRead function to a string type (In the example, it is named FileContents). 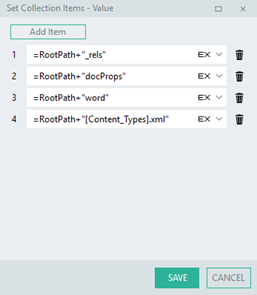 Using a ForEach function: Assign the list to loop through as the list type of your CustomType created at the beginning of this process (this can be an input parameter like the example, or it can be a CustomType list within the process). This will be used to loop through all the possible placeholders and their corresponding values. Once the ForEach.CustomType has completed, the FileContents type will contain the file contents with the replacement done. *Note: It doesn’t necessarily have to be the input, but must achieve the goal of taking the initial Doc file path , concatenating it will the random string generated at the beginning of the process + “\”. This will be used as the root path of the extracted files. For the “Files to compress”, assign it to the List of files that you created earlier. This will create a new word document in the supplier new file path. Finally, we need to clean up the files so there aren’t a bunch of unzipped files all over the place. To do this, simply use the DirectoryDelete function and point it to the ‘$.Input.DocxFileFullPath+GenerateRandomTempFolderName.Base64String’ location. This will then remove the unzipped Word document folder structure. So now we have made a CustomType “Dictionary” and our Word populating process, we will now need to combine these to achieve our goal. Add items to the list which contain the placeholders of the document and their corresponding values. The above allows a large chunk of pre-formatted text to be inserted into the Word Document.